Outside Marine Furniture or outdoor casual furniture upholstery has the same characteristics and needs the same specifications as addressed in the Exterior Upholstery section of Marine Services. 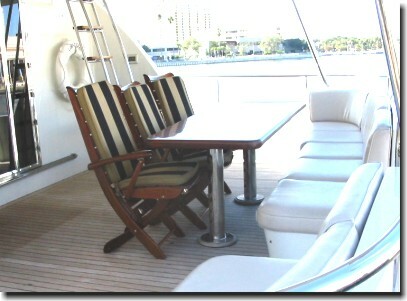 What can be unique about Marine Furniture is the different materials Catalina Custom has for you to choose from. Catalina Custom has available top quality, furniture grade, canvas from Sunbrella, Outdura and other manufacturers that offers many choices of rich colors, luscious textrures, exquisite patterns and soft hand while providing tuff durabilty for years of service. From Phifertex and Textilene comes PVC-coated and vinyl coated polyester woven yarns that are highly durable, breathable, stain resistant and easily cleanable.These fabrics offer many different patterns and weaves to choose from and can be used for deep comfort cushions or pipe furniture with floating slingable panels. Also new from Phifertex, is a cloth material called Marquesa. This fabric is engineered for deep seating applications whether indoors or out and features a soft, touchable texture not found in many fabrics in the casual furniture industry.